Please join me in congratulating Michael Tharp for his great Tall Tales Speech at the Verde Division Contest today. Michael won the Alternate (2nd place) position in the contest with his "How I Became A Cat Owner" speech. Michael did us proud with the best presentation of his speech yet. For those of you who missed Michael's speech along the way, we hope to have a video of his speech available for viewing soon. Cheering Michael on today were Gail, Rainer, Michael's wife Bea and Nancy. If you attended our last meeting, you heard Dan McGinnis (Biltmore Toastmasters) present a practice run of his International Speech "Imagine", well, Dan not only won the Verde Division International Speech Contest, but he also joined Softalkers today. Leo won Alternate in Area International Speech. Join me in congratulating Michael Tharp, the winner of the Area V2 Evaluation Contest. Michael presented an excellent Evaluation, hitting all the points and most of all summarizing the points of the evaluation in his conclusion. Michael Edgar also did us proud with his Humorous speech about his dogs? Unfortunately, the dogs didn't make it tonight, they were edged out by purse snatching and a wild pig. Next: Verde Division Speech Contest will be held on Saturday, October 19 at the Arizona Game and Fish on Carefree Hwy. 10/30/2008 - At our odd 5th-Thursday dinner, which we have traditionally used as an occasion to have a social gathering, we had a surprise visit from Jane Nelson, our (Y4) Area Governor and even our Western Division Governor (Jane's boss), Julie Schrell. 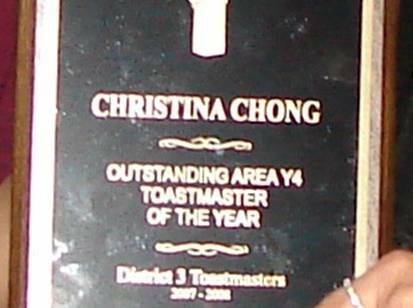 What really surprised us all: at the dinner, Julie announced the winner for the Area Y4 Outstanding Toastmaster of the Year (OTOTM) and it was.... Christina! This is the highest honor given to a toastmaster in the area, and is based on participation, points, and inviting guests. Way to go Christina! Below are a few photos from the events. 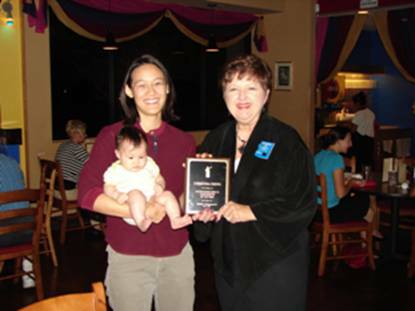 Here's Julie presenting the award to a surprised Christina (who was carrying her baby at the time of the announcement). A blow-up of our super-zoom camera reveals the evidence.